Introduction: An uber-fast, ultra-lightweight Java classpath scanner, module scanner, and annotation processor. 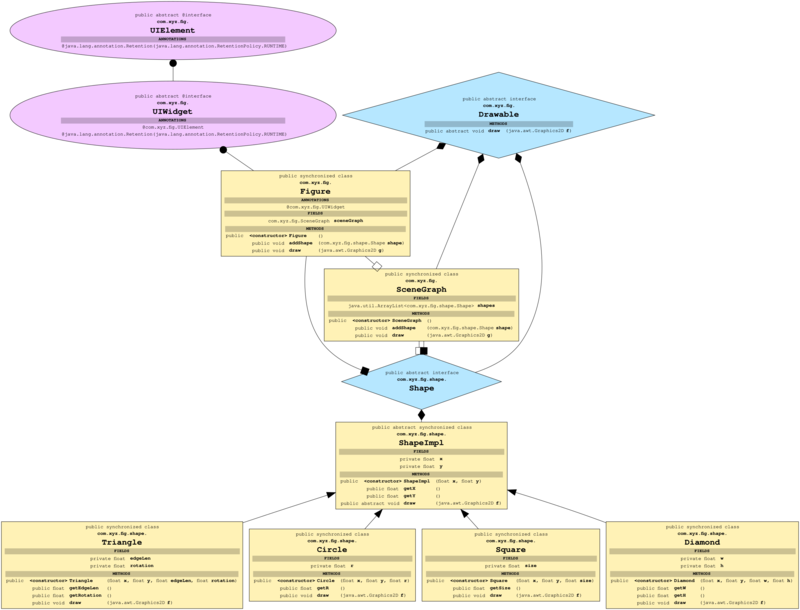 ClassGraph (formerly FastClasspathScanner) is an uber-fast, ultra-lightweight, parallelized classpath and module for Java, Scala, Kotlin and other JVM languages. ClassGraph won a Duke's Choice Award (a recognition of the most useful and/or innovative software in the Java ecosystem) at Oracle Code One 2018. Thanks to all the users who have reported bugs, requested features, offered suggestions, and submitted pull requests to help get ClassGraph to where it is today. ClassGraph has the ability to "invert" the Java class and/or reflection API, or has the ability to index classes and resources. For example, the Java class and reflection API can tell you the interfaces implemented by a given class, or can give you the list of annotations on a class; ClassGraph can find all classes that implement a given interface, or can find all classes that are annotated with a given annotation. The Java API can load the content of a resource file with a specific path in a specific ClassLoader, but ClassGraph can find and load all resources in all classloaders with paths matching a given pattern. The following code prints the name of all classes in the package com.xyz or its subpackages, anywhere on the classpath or module path, that are annotated with an annotation of the form @com.xyz.Route("/pages/home.html"), along with the annotation parameter value. This is accomplished without loading or initializing any of the scanned classes. The following code finds all JSON files in META-INF/config in all ClassLoaders or modules, and calls the method readJson(String path, String content) with the path and content of each file. See the code examples page for more examples of how to use the ClassGraph API. 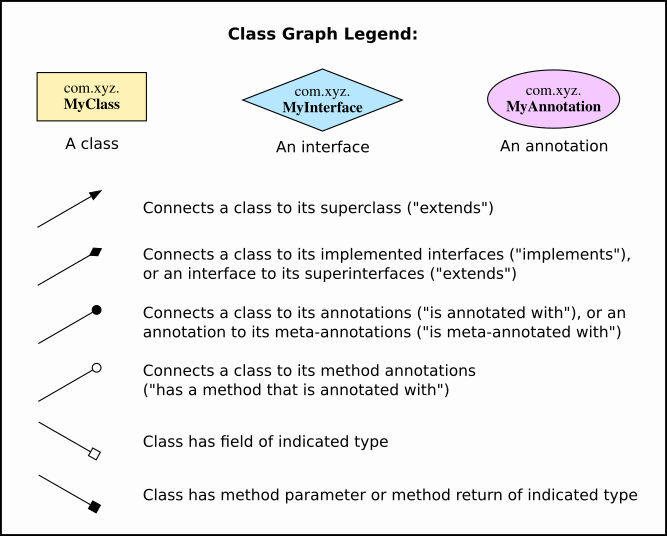 ClassGraph has the ability to build a model in memory of the entire relatedness graph of all classes, annotations, interfaces, methods and fields that are visible to the JVM. This graph can be queried in a wide range of ways, enabling some degree of metaprogramming in JVM languages -- the ability to write code that analyzes or responds to the properties of other code. ClassGraph reads the classfile bytecode format directly, so it can read all information about classes without loading or initializing them. ClassGraph is fully compatible with the new JPMS module system (Project Jigsaw / JDK 9+), i.e. it can scan both the traditional classpath and the module path. However, the code is also fully backwards compatible with JDK 7 and JDK 8 (i.e. the code is compiled in Java 7 compatibility mode, and all interaction with the module system is implemented via reflection for backwards compatibility). ClassGraph scans the classpath or module path using carefully optimized multithreaded code for the shortest possible scan times, and it runs as close as possible to I/O bandwidth limits, even on a fast SSD. ClassGraph handles more classpath specification mechanisms found in the wild than any other classpath scanner, making code that depends upon ClassGraph maximally portable. ClassGraph can scan the classpath and module path either at runtime or at build time (e.g. to implement annotation processing for Android). ClassGraph can find classes that are duplicated or defined more than once in the classpath or module path, which can help find the cause of strange class resolution behaviors. See the wiki for complete documentation and usage information. FastClasspathScanner was renamed to ClassGraph, and released as version 4. ClassGraph has a completely revamped API. See the porting notes for information on porting from the older FastClasspathScanner version 3 API. In particular, the Maven group id has changed from io.github.lukehutch.fast-classpath-scanner to io.github.classgraph in version 4. Please see the new Maven dependency rule and module "requires" line in the Wiki documentation. Feel free to subscribe to the ClassGraph-Users email list for updates, or to ask questions. There is also a Gitter room for discussion of ClassGraph. ClassGraph was written by Luke Hutchison (@LH on Twitter). ClassGraph would not be possible without contributions from numerous users, including in the form of bug reports, feature requests, code contributions, and assistance with testing. Hibernate has the class org.hibernate.ejb.packaging.Scanner. bndtools, which is able to "crawl"/parse the bytecode of class files to find all imports/dependencies, among other things.